Author Serena Miller believes so. A TIME magazine article titled “Why Amish Kids Are Happier Than Yours” offers five “secrets” English parents can learn from the Amish. They’re taken from Miller’s book More Than Happy: The Wisdom of Amish Parenting. One of these five ideas I hadn’t thought of before. Any guess which one? Extended Family – large family networks boost a child’s well-being. Imperfect Hospitality – welcoming guests into the home, without making the home “perfect” before they arrive, “teaches kids to live without shame”. Hands-On Skills – practical skills build confidence and other qualities that lead to life success. Practical Forgiveness – daily practice of forgiveness makes Amish children feel secure and lets them show respect to loved ones. Creative Boredom – without TV and on-demand entertainment, Amish children have more chances to flex their creativity muscles. To be sure, I’ve often had the impression that Amish children are a happy lot. But is that always the case? To look at the other side, are there any reasons Amish children might be less happy than their counterparts? The first that came to my mind: What about those who love school and formal learning, only to have it end in their early teens? I once asked the eighth-grade sister of an Amish friend how she felt about her time at the schoolhouse coming to an end. It sounded like she’d miss it, but that she was resigned to the change. Many of her peers don’t feel the same way about school ending. They can’t wait to graduate. But she can’t be the only one. Surely some struggle more with this limitation than others. For someone with a passion for book learning it could be downright miserable. That’s one of the possible reasons, though I would guess this covers only a minority of children. What’s your impression — are Amish children happier than non-Amish children? Why do you think so? Or why not? 59 responses to Are Amish Children Happier? I’m not looking to criticize or make fun, but I am wondering how it is possible to measure happiness. As one who loves books & learning, I probably would have enjoyed taking my education further but I have learned a person does not stop learning just because they leave school. Is it even possible to measure happiness? I definitely agree that learning does not end. There are very learned Amish people that don’t necessarily have the degree or credentials. But I think that depends in part on access to learning materials and the acceptability of self-study. I have in mind more those households or communities where this may not be as encouraged or acceptable as in others. One thing I learned from Karen Johnson-Weiner’s Train Up a Child is there are certainly differences in Old Order education and how students are equipped for life after schooling ends. You ask a good question about measuring happiness. I don’t know how possible this is to do with precision, though I guess you can develop more-or-less objective criteria, depending on what you want to value and count towards “happiness”, but probably taking in certain quality of life indicators like income, health and so on. However it seems any study could leave out hard-to-measure intangibles and/or reflect the biases of the study-makers. You do see researchers attempt to do this on a large scale, with the annual “Happiest Country on Earth” lists. Anyway, interesting question and topic. I second that, Mark! I wondered where this author got the idea of “imperfect hospitality.” The Amish women I know are perfectionists when it comes to their homes. Your question is a good one, I must say. How do we measure happiness? I believe we all came to this earth to fulfill whatever plan God has for us. When we live in accord with that purpose, I think we know it. That to me, is happiness. Mark, I agree with you about cleaning the house & getting it perfect for Gma (Gmay). I’ve heard from too many ex-Amish women how they were busy for days cleaning the house out of fear of criticism. Just saying . . .
As one who has spent nearly half of his post-high-school years sitting in a classroom, I can appreciate the desire for formal education. However, I’ve also learned that learning is an ongoing thing as long as one wishes to learn — whether in a formal setting, informally at the feet of a wiser one, a trip down to the local library, or just pondering on a favorite subject. I can appreciate the point made…, but experience has shown me that there is a Plan B that isn’t so different and has a few perks of its own. I like the creative boredom option (which is, I’m guessing, the one that was a bit of a surprise on the list to you, Erik). One Amish-vs.-English difference that I don’t see in the listed mix is the number of siblings (unless that is part of the ‘forgiveness’ mentioned 😉 ), which would be immediate and not extended family. This would give the children more people to play and be with, and require learning a higher level of “getting along” than smaller families would. And I think that the larger number of children would force parent to be doting (as their attention is divided more), making for less self-focus and expecting children as a norm. On a related issue, Kevin Leman (for one) has written extensively about birth order and the characteristics that are typical for the only child, first-borns, middle-borns, and last-borns. As the English families have grown smaller and smaller it seems that the middle children are a dying breed. I wonder what (if any) this growing absence of the typically more stable, diplomatic and sometimes more persevering element may play into the environment (and even the happiness) of the modern family — and how that may vary from present day English to Amish. It’s a good guess Don, actually though it was #2, “Imperfect Hospitality”. I’d never really considered this. But, in some people’s households, guests coming over is an event requiring a lot of prep and fuss to get things perfect, which can certainly add stress to everyone involved. Drop-ins are sort of expected in Amish communities, particularly at certain times like Sunday afternoons, so I can see how Amish people might be more laid-back about this. As you know due to the large families there are simply a lot more people around in Amish communities, so you kind of have no choice but to become used to neighbors and family and others paying visits. Though I think I remember Mark commenting on here recently that prepping for church is a good deal of work and stress, but I guess that only happens once or twice per year depending how big your church is. Good point on the siblings. How many times have I heard an English person wish they had an older or younger sibling. In an Amish family you have a decent chance of getting both! All of you have made great comments. I love your insight especially about learning continuing, if desired, way beyond required class time. Ed told me early in his Amish experience, “My new friends don’t care that I graduated at the top of my class from Virginia Tech; they just want me to drive a nail straight and I can’t do it!” We’ve laughed quite a bit over his predicament. But it does show the difference in approach and priority. And he truly misses having time for more reading and “book learning”. Once you have a family to provide for, there’s not much time for anything beyond the daily scramble to make ends meet. Your comment on how much Ed misses book learning to me reflects how dedicated he must be to his choice of life as a convert to the Amish. Certainly he knew going in that that aspect of his life would not be as realized as it might have otherwise been if he had chosen not to join the Amish. Needless to say Ed impresses me, hopefully one day I’ll be able to tell him that in person (even though I know that’s not what he’s looking to hear 🙂 ). Thanks for sharing Anne. I wondered if something like that wasn’t the case where he was Anne. Of the current Virginia communities are there any that align somewhat with his current group in terms of their affiliation? I know he started in a rather atypical community to begin with in Pearisburg. But a couple of new settlements have been founded in VA in the past few years, at least one of which is a New Order group, as is the one community in NC. Perhaps even if he were someplace like Ohio he might find a community that he is more comfortable with regarding expression and intellectual stimulation, and also be closer to family which I’m sure you would all appreciate. When he left here, he went with the folks in his group that were wanting to hold the line on modernizing (the community was modernizing with electricity and cars). A bunch of them started this new group in Fertile. So I don’t think he’d come back here to be a part of the group in Pearisburg (is it still there?). He valued the OO goups and has had good intellectual stimulation with some of them, but it doesn’t seem to be carrying through to the group he’s a part of now. I think it shows that he values the OO living even above books, amazing! Are there any OO groups in Virginia that you know of? There are 6 horse-and-buggy Amish settlements in Virginia, at least there were as of late 2013. The people in Halifax County are out of Dover, Delaware. The folks in Charlotte County have roots in Lancaster County. Chatham in Pittsylvania County is a newish New Order settlement out of Union Grove, NC. Pearisburg you know and still exists, at least did as of a couple of months ago when we posted about them last. As of 2013 there are two others which I don’t know much about, in Lee County and Tazewell County. Thanks for the list Erik. Very Helpful!!! And Mark, you also offer hope that Holmes Co might be better. If he ever begins to look around, I’ll be armed! Anne, there is a lady in our church whose family left the Swartzentruber community when she was young. Her sister’s family left the Pearisburg community sometime after Ed and others moved to MN. I got to spend a long, enjoyable afternoon with her and her niece this last Sunday. I hope my husband and I may get to meet Ed’s some time. We are hoping to make it to one of your daughter’s concerts in May. Perhaps we’ll get to meet you too! Hi Naomi, and yes, it would be great for any of us to meet you and yours. We’d love it! After I said all that about not enough challenge w/books, etc. we got a letter today in which he says he’s reading a “heavy” book on Plato, and also, “How the Irish Saved Civilization”; a book from our shelves. So at least he’s finding a way to continue his own education. Although I do not know Saloma Miller Furlong personally, I get the impression that you do, Erik. I think she may be the person to ask for a different perspective on this question. My understanding from hearing interviews with her is that she is one person who did NOT feel there was room for continuing her academic learning on her own after eighth grade, as long as she remained in the Amish way of life. For that matter, I doubt she would agree that an Amish childhood is by design a particularly happy one. A male/female difference, perhaps? (It seems to me that many people who fantasize about wanting to be Amish are picturing the life of an Amish man rather than an Amish woman.) Or just an example of how no culture has a monopoly on either happiness or unhappiness, especially for young people who are finding their place within it? Childhood happiness may be more a measure of how good of a “fit” a particular young person is for the culture into which they happen to have been born. For children who readily conform themselves to Amish life, certainly life is happier than for those who constantly chafe at it. And of course, childhood is all about preparing for adulthood. I think there may be more potential for lifelong happiness for those “readily conformed” to an Amish life as children than there is for children who readily conform themselves to a life of modern conveniences, instant gratification and conspicuous consumption, but then, that is not automatically the lifestyle of every “English” family. And in the process of getting to lifelong happiness, there is often some childhood suffering. The Amish are known for strict discipline, and certainly for hard work that is not about “fun” or “creative play.” I have no doubt that these childhood “hardships” prepare them for adult life in their community, and thus make it more likely they will be happy within that life. For those who leave, however, I would imagine that the sacrifices of their childhood look very different. If Ms. Miller Furlong would be comfortable responding to this essay, I would very much like to hear her point of view. Of course, the real reason for asking ourselves “Are Amish children happier?” is not really about the Amish children, is it? We ask this question because deep down, we want to know if we are doing the right thing for our own young people, and if there is something our culture can learn from another in achieving our own culture’s parenting goals. It sounds as if our goal is to make our children happy during the short years of their childhood. I highly doubt the Amish would say they have the same goal, but rather to prepare them to be happy in heaven forever, which, rightly or wrongly, they believe requires many very specific sacrifices now. Perhaps that is the most fundamental difference of all between Amish and at least some “English” childrearing. Perceptions of "fun" and "work"
I think you’re right about Saloma, Trish, based on her writings I’ve read. Another thing that came to mind reading your comment re: fun, is that the idea of “fun” is somewhat different. Or at the least work can be considered something fun, communal, and not necessarily drudgery (generalizing again, I know slopping out manure is not anyone’s idea of a night on the town 🙂 ). I think fortifying this attitude alone sets Amish people up to be more productive, which has the twofold benefit of building a sense of self-worth, and also contributing to one’s material situation later in life. Re-reading your comment now I think you were making about the same point. Great comment, especially appreciated the last paragraph. I can imagine it might be uncomfortable for a non-Amish parent to read things like this article (and on second look, the title itself actually reads like a challenge: “Why Amish Kids Are Happier Than Yours”). Had to say, Erik, I’d rather be mucking out stalls or sweeping a barn with a friend than at any club or fancy restaurant on a Saturday night! 🙂 I think I’m the exception to the rule of the English world when it comes to that. Trish, your insights are deep and well articulated. I especially like how well you described my childhood in describing the difference between the “readily conformed” compared with those who constantly chafe. I wanted (oh, how I wanted!) to be the former, but I couldn’t help being the latter. I now realize that if God had intended for me to live out my life within the Amish community, then He would have endowed me with a conforming nature instead of the spunky, inquisitive, and precocious girl I was. My husband, David, was there the morning I was taken back to my community. In “Bonnet Strings” he wrote, “My heart went out to her, yet it was breaking at the thought of her spirit roped and bound by a force I could not change.” He said it well… I often felt like my spirit was roped and bound in my original culture. That said, I am grateful for my Amish childhood. Yes, I indeed struggled, sometimes more than I thought I could bear. But it is in working through our struggles that we learn the most about ourselves, others, and the world around us. These experiences have humbled me and given me an appreciation for freedom, including the the fulfillment of a lifelong dream of earning a college education. It took both my experiences of growing up Amish and my chosen life to develop what the Germans call a “Bildung,” which is described as “a process wherein an individual’s spiritual and cultural sensibilities as well as life, personal and social skills are in process of continual expansion and growth.” My formal education is an important piece of this, but it is not the whole of it. And there are certainly things I miss about my culture, the biggest one being the sense of community. People try to tell me that we have community wherever we go, but it just is not the same as growing up in an Amish community where the adults have known you since you were born. I miss the Amish church singing, weddings, and the way they come together when someone leaves this world. To ask the question of whether Amish children are happier than their “English” counterparts is setting up a dichotomy that cannot be answered as posed. But it does bring up the question Mark asked earlier, “How do we measure happiness?” I think we each have to answer that for ourselves, for no one else can. Trish, I find your question of why we ask this question to be insightful as well. Yes, I believe we can learn from the Amish, not just about child-rearing, but in many other aspects of life. And yes, most Amish do believe that preparing their children to enter the kingdom of heaven is a higher goal than happiness here on earth. I know that I’m generalizing here, but some of these beliefs are pretty universal among the Amish. I will henceforth consider us on a first name basis! I thank you for your response, which I believe adds a great deal to the discussion at hand. I also invite you to contact me if ever you are in the market for a freelance editor, proofreader, or indexer. I specialize in books related in some way to spirituality, and though I’ve never yet worked with an author who came from the Anabaptist tradition, I think it could be very interesting to work on one of your projects. I believe Erik would have my email, because the website collects them when we post. Trish, excepting spam, I have little against commercial messages! (see sidebars of this website 😉 ). That’s how many of us eat, after all. Anyway, I’m glad Saloma joined us on this topic. As every Amish person I’ve ever met would say, “Amish people are human beings too.” I think all of these five points have merit to them, but I don’t think it’s as simple as adding them up, assuming that average English person X has zero or only one of them, and drawing a conclusion. If it worked like that, far more of us would be Amish, because we’d want guaranteed happiness. 🙂 But not all Amish can claim all of these things as parts of their lives. Land prices rise and families scatter to different states; children learn practical skills, but far fewer are farming than ever before. 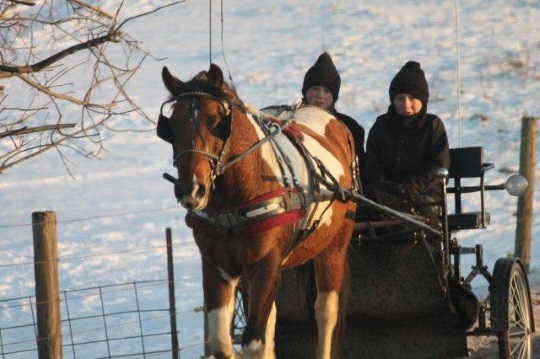 The Amish way of life isn’t a frozen ideal, and more importantly, isn’t *one thing* from Kalona, IA to Elkhart/LaGrange, IN to the many different Amish lifestyles in Holmes County, OH. To me, it’s too dangerous to generalize. It obscures the people for the postcard picture. Good point Emily. These describe an ideal life, but of course Amish people are not immune from dysfunctional families, personal grudges, or technology sneaking into pockets to wipe out that “creative boredom” time. But on the broad-strokes level I do think your average Amish household is more likely to enjoy any of these than the average non-Amish household. I put that down to religious belief and culture, which is about the habits and tendencies of a group of people over time. I don’t mind generalizing in this way as long as one stays mindful of the caveats like you mention in the differences in lifestyle, community, etc. But as you point out you can’t just check the boxes off for each group, Amish and non-Amish, and then compare because it leaves out too many factors. To some people happiness is a new car. To others its seeing their wife smiling. To another happiness is feeling content. To another it may be relief from pain. The author defines things that can very make for happy people but the author doesn’t really define Amish very accurately. The extended family is a reality that does provide security. I know Amish personally who do straighten up the house before guests arrive. Hands on skills is really very true and does provide personal satisfaction and an income. The one about forgiveness is a really big paradox. Forgiveness is a teaching, even to the Anabaptist emphasis on loving our enemies. But with in the Amish and Amish Mennonite communities, outsiders can certainly be scorned, Bishops actions be over bearing and unforgiving, parents be merciless at times, and the vast history of Church splits certainly does not testify to our ability to forgive, quite the contrary. The fact remains that we teach forgiveness and we should practice it more effectively. The last one is true as well, without TV Amish young people have the freedom to be creative and that they do and it is a blessing! At times however creativity is stifled due to ideas that it may promote worldliness. We could do better at encouraging creative expression and hopefully not hindering a gift that God has given. I think we can over-complicate it though. To boil them down, the points she mentions basically serve to do a few key things – reduce stress, provide security, and build confidence. All of those contribute to happiness and well-being no matter the culture. Blessings to you and I pray the peace of the Lord be with you today Brother. Thanks Andrew–and I hope I wasn’t too short in my response. I think you made some valid points along with some adding some good detail to this topic, especially what you write about forgiveness. It seems to me that beyond it being the “right thing” and what Christians are commanded to do, forgiveness is an undeniably healthy practice–spiritually, physically and emotionally. If only it were so easy to practice. Its a challenge to live out our lives for Jesus everyday. You are right forgiveness is healthy and is often the sandpaper which God uses to refine our sharp edges and make each of us easier to rub elbows with. Thought it might be a fun read. I own a preschool (for English students) and have worked with children all of my life. I visit our cousins in Haven/Yoder Kansas very frequently (they are Amish with young children) and they are happy. So are some of the non Amish children I work with. Discipline and work ethic and very different between the two groups. Sometimes I think English children feel the need to be entertained constantly and I don’t see that as much with the Amish. I had long been wondering if someone would write this book. It seems like it would have a ready market. I know Amish people don’t like being idealized but that aside it sounds like a positive resource. Of course reading “how-to” manuals is a very English thing to do, but with a task as important and difficult at times as parenting I guess everything helps. Sounds like you have a good vantage point with your work and relations to observe differences between cultures Susan. Susan, glad you’re a reader. I’d like to remind readers that Amish have different parenting styles just as any other culture. To me, it’s unfair to pen a tome that lumps all Amish together to examine their childrearing skills. Perhaps it’d be more culturally accurate to focus on one order and those parents’ skills. Likewise, one cannot lump all orders together and assume the children – across the culture – are happier. Some are, some aren’t. I’ve experienced runaways from the Swartzentruber order who carry deep wounds from verbal and emotional abuse. And I know some Old Order former-Amish who are also struggling to overcome injurious parenting. I think Amish children are happier, because they don’t grow up so fast like children out in the world. Todays kids who live in the world have no time just to be young and carefree, enjoying all the things children should do as kids. Climbing trees, playing outside and using their own imagination. Modern kids know too much and their innocence is taken away. Its all about getting good grades, getting a boyfriend or girlfriend and looking like a supermodel, instead of just kicking back under a tree and enjoying being young. Well put Julie. Children seem awfully precocious nowadays. Maybe every generation makes that same observation. The problem, I think, is that it’s easier to get yourself into trouble today than it once was–given the amount of material wealth, free time, and technology available nowadays. Julie, I don’t think it’s quite so clear-cut. I did grow up too fast. And it was because responsibilities were heaped on my shoulders long before I was mature enough to handle them. And I was also abused. So Amish children can lose their innocence too. I think the mainstream culture places way too much emphasis on “the pursuit of happiness.” In my experience, happiness is something that comes about when we live our lives in accord with our conscience and purpose and stop trying to be someone we’re not. And to me this includes offering “recipes” for raising children. To offer an Amish recipe for it seems to me a cliche and highly simplistic. Sorry, I didn’t mean to shut down the discussion here, folks. This is my knee-jerk reaction when I perceive romanticism of the Amish. It happens to the be same one I have when someone demonizes them or makes unrealistic “reality” shows about them. The Amish are neither perfect nor demons. They are human and therefore somewhere in between. Some Amish people are apt to travel down their rightful path than others, while others become lost souls, just like in the mainstream culture. Julie, your point is well taken about children being allowed to be themselves and how important enjoying nature is in their development. I think this is true, no matter which culture they live in. And it is always a tragedy when a child has his or her innocence stolen. Please don’t allow my first reaction to end this important discussion. Same practices in different settings? No worries, Saloma. I think I can agree with the idea that it may be simplistic or overly ambitious to think you can seamlessly transfer one set of habits out of one culture into another setting and expect the same results. Some of these positive child-rearing experiences described in this book may depend to some degree on other factors prevalent within Amish culture which English parents may not have (for instance, willingness to use physical discipline; uniformity within the culture serving to reinforce your own child-rearing practices; etc). In other words you need all the ingredients for the pie to taste just right. At the same time many of these ideas seem so “common-sense” to me that trying to adopt them wouldn’t hurt and in most cases probably would help (for instance, restricting tech time as one of my English friends has done in the past with his children on purposeful “no tech days”). I thought about this issue quite a bit when writing my Amish business book, which you could say is within the same vein as consisting of ideas taken from Amish examples in a book read by a mainly-English audience. For what it’s worth, the stories by other mothers in Family Life Magazine help me to do better in my own parenting. I find the stories and advice to be almost always well balanced, with a more loving and forgiving attitude than the secular environment I was raised in (which was not perfect, but pretty good). There are other books on “Christian” child rearing that I steer clear of because they emphasize rigid training at the expense of gentle but firm guidance and forgiveness. Thanks, Erik. I cannnot tell you why, but I think there is a huge difference between a book on how to learn from Amish business practices versus one on how to learn from Amish parenting. Your point is well taken: How are English parents going to make up for the lack of extended family? I didn’t find your book to be simplistic, as I’m perceiving this book on Amish parenting is. Perhaps I should read it before criticizing it so harshly. I do think that Amish children, especially those whose families are still able to farm, are far more immersed in nature than the average English child today, and not only at the level of enjoying it in their free time. They know that even food that literally “grows on trees” doesn’t end up on your plate without hard work. They also know that sometimes, hard work is not enough, when the rain doesn’t fall or the frost comes early, and you are at the mercy of a world that’s bigger than you are. They know that meat does not appear already wrapped in cellophane in the grocery store’s refrigerator; they realize that something must die so that you can live. This may not be a particularly romantic view of Amish life, but I think it has a beauty of its own. Many’s the time I’ve seen Amish children playing softball (or is it baseball?) in a schoolyard, yet I think the image of Amish childhood most indelibly marked on my brain cells is the sight of a boy no more than twelve carrying a rifle nearly as tall as himself as he walked barefoot behind a half dozen of his family’s cattle on the way up a wood-lined trail to a pasture. I don’t know if the rifle was to protect calves from coyotes or to plink a squirrel from a tree for dinner, but I know, as a hunter myself, that the boy was surely enjoying the hunt, and it was surely a real contribution to his family’s livelihood. There was a certain dignity in that barefoot boy with a rifle that fancy sneakers and video game consoles just can’t match. I have to admit I don’t always sense the same dignity when I see a young Amish girl hanging laundry. I can’t even tell you why, except that maybe it’s because my own “fit,” even as a woman, is with the hunter in the field instead of the woman at the clothesline, and I feel lucky to have been born into a culture in which I could seek out the role I wanted, in adulthood even if not as a child. This post meandered from immersion in nature to the rigidity of gender roles, and maybe that’s fitting. Amish life offers those born into it both advantages and disadvantages, from my outside perspective. Trish, your observations are very accurate. And you’re right, that average Amish child gets more outdoor time than the average “English” child. That twelve-year-old with the rifle is a common sight among the Amish. I’ve never been able to get over my fear of guns. I’ve heard too many stories of accidents with them. About hanging out the clothes… I love doing that. I miss not having a clothesline. I used to love to hang all the kitchen towels together, then the bath towels, and the sheets… And it’s like you bring the smell of the outdoors in when it comes time to fold and put away the clothes. This is a great example of how we are all different. Good thing, isn’t it? Otherwise there would be tasks no one is willing to do. Indeed, Saloma! And oddly enough, in the last year I have developed a sense of satisfaction from something that I’m told even Amish women don’t do anymore: washing laundry by hand on a washboard with a bar of soap! I even gave up my washing machine entirely for Lent last year. I don’t plan to repeat that feat this year, and I don’t do the majority of my laundry by hand, but every so often, I find it convenient for washing just a few things or for getting out a stubborn stain, or just when I want a feeling of accomplishment combined with a stress reliever. And I’ll tell you, no machine will ever get athletic socks as white as a washboard and a bar of Zote laundry soap! Isn’t it funny the things we find satisfying? If we ever visit each other on laundry day, I’ll wash and you can hang. Of course, I realize that most Amish women are not doing laundry for just one person, and they have a lot more tasks to take care of than I do, so the popularity of the wringer washer should perhaps not be surprising. Trish, I will hang the laundry any day you’ll wash! Before we got our first wringer washer, my mother used to do all the wash by hand with a washboard. She usually had two in diapers at that time. That sounds like the perfect recipe for drudgery to me. BTW, I don’t mind giving out my email: saloma@salomafurlong.com. And feel free to visit my blog sometime, Trish. I hope to hear from you. Its clear this subject brings out some sensitive issues. I emphasize a need for honesty in our Church. No one is perfect. All have sinned and fallen short of the glory of God. If we are honest we will be able to insure that the children within our realm of influence are happier and discussions like this are what makes it happen. I have seen very unhappy Amish families as well as picture perfect Amish families. Often the pressure to live up to unrealistic expectations of the perfect family life causes people to hide their flaws and become pretenders. As Amish or in my case Amish-Mennonite I am committed to being real and challenging our Church to be real and honest. Saloma you mentioned you were abused. Thank you for your openness and I pray God’s blessing, healing and restoration in your life. I also pray that God uses you to give courage to others who have been where you have been so they may know the healing power of Jesus as well. God bless you all. Andrew, thank you for your thoughts. Much of the healing and restoration has happened, though I think it is a lifelong process. Many people have told me that they have taken courage from reading my story. I believe we are all pilgrims on this earth and that we help one another along the way as best we can. I’m not understanding this. Is there some thing Amish folks do that English don’t, like a special time/event set up to talk about forgiveness? I understood it to simply be forgiveness in action — something that the Amish (whether by personal faith or church pressure) are seemingly compelled to do, and is less seen in the ‘English’ world. It should be everywhere — but in reality it isn’t always so. Im wondering as Im reading this if you all are comparing your own childhood to the idealistic ideas that you imagine that Amish children live. I feel quite differently than most of you because of my own upbringing in the early 60s. I lived in the country and was surrounded by animals, playing in woods, lakes, & fields of food, we lived by the country code of loving our neighbor as ourselves, so though we werent related by blood, we were related by community and it was strong. I had a serenely happy childhood in that setting…My parents were practicing Christians and raising us up to be good productive adults. The only thing I can really find that is much different from the Amish in my early childhood is that we were not taught a strong work ethic early on though we were taught spiritual ethics. We had live in maids from Mexico who did all of the housework most of the time. I’ve often wondered if this was a good thing or not, because I had problems along this line later when we quit employing them in my teenage years. My brother, I, and our cousins, and community kids all worked on family farms.. By around ages 7-8 we were driving tractors in the fields and big grain trucks to the grain elevator during harvest, we drove trucks in the fields for haying.. More of the young guys worked on the farms but since I was a tomboy I was right along with them. I wasnt a very soft girly-girl though I did learn to cook, sew, & crochet. Girl Scouts & 4H helped a lot along those lines. We hunted & fished with our father from the diaper.. and he was happy to take us along on his excursions including some of his business trips. We had community suppers and had great times with everyone in the community. It didnt matter what church you went to.. if you lived in the community, you were welcome and a part of it. The community where my mother was raised & many of my cousins too still have a community club and they get together once a month and have a big pot luck. Im with Saloma on this one.. I really miss it. I know our community groups arent exactly like the Amish communities, but in many ways they are. Country children are raised with different values than children who are raised in town are. I think that is why I feel a kinship with the Amish in many ways. Its not their difference that draws me, but their sameness. I feel at home with them, though I would never make a good Amish person.. Im too independent and I’d be tossed out on my ears.. “Bildung” describes my life perfectly and I’ve been frowned upon by churches I’ve been a part of because of this spirit of evolution, often frowned upon in conservative Christian communities. I honestly cant believe any one sects children are happier than others.. English or Amish.. I think its an inside job for us all. I appreciated your comment Kim. It gave me something to think about for another post I am working on. Sounds like you had a great childhood. I think “rural values” may be a large part of the appeal of Amish life for many Americans. True story…Last Tuesday I went to the country to a livestock market. The auction started at 1:00 and the dairy cows started the parade of animals entering the ring, strutting their stuff and escorted out on stage left. Each animal got about two minutes of “Fame”. At the start of the auction I observed a young Amish man with two small children. The brother looked about four and the little sister, about two and half. Those two lovely children sat next to their dad for three hours and they were the best behaved children I’ve ever seen. They would scan the room and take prolonged views of things that caught their eye. They watched each animal come and go and sometimes they would whisper into the others ear and giggle a bit. They were totally content being there and seemed to enjoy every second of it. You will never find an English child capable of sitting there five minutes. These Amish children were certainly happier than anyone else there. Last summer at the county fair (and in Elkhart County, the fair is the biggest event of the summer, maybe the year), an Amish family sat behind me at the rodeo. One of the boys entertained himself while we waited for it to start by wadding up bit of the paper wrapper off his straw into little balls which he either threw or blew in my direction. Pretty accurately, I might add! The real trick was always doing it when his parents weren’t looking. Talented kid! And happy. Jerry and Trish, I much enjoyed both your stories. I’ve witnessed both sides of this coin. I think there is a lot of truth to the idea of Amish children being well-behaved, especially when they are younger and physical discipline is still a factor. We have also seen rowdy behavior from Amish adolescents (especially in certain communities) as we do from other teens. Sometimes that rowdy behavior makes the news, or you can also read about it in books like Rich Stevick’s Growing Up Amish. Nothing parents would be happy about, English or Amish, but I would think for most it is a phase they go through before marriage and settling down. Yes, I think the boy with the paper wads was probably a couple of years shy of Rumspringa, and just champing at the bit! I liked the book. Nothing wrong with it so long as common sense is used while applying principles to one’s parenting style. Leave a reply to Are Amish Children Happier?